New poll shows Likud beating Blue and White by 3 seats, right strengthening to 67 seats. 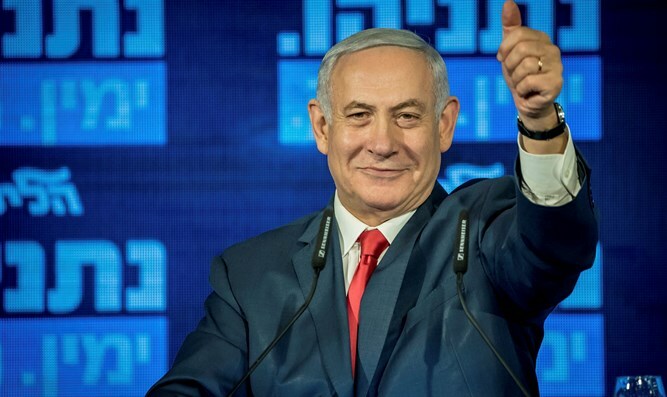 A new poll published by Haaretz revealed that if the elections had been held today, the Likud would have defeated the Blue and White party by multiple seats. According to the poll, which was conducted by pollster Camille Fuchs, if the elections were held today the Likud party would receive 30 mandates while the Blue and White party would receive 27 seats, three seats less. The survey further showed that the Labour party would receive ten Knesset seats while the United Right and Hadash-Ta'al lists would receive seven seats each. United Torah Judaism would receive six seats while the New Right, Kulanu, Shas, Zehut, and Meretz would receive five seats each. Yisrael Beyteinu and the United Arab List-Balad would receive four seats each. The poll showed the right-wing bloc strengthening to 67 seats while the leftist bloc receives only 53 Knesset seats. Under this scenario the right would still win the elections even if one of the smaller right-wing parties failed to clear the electoral threshold. The Haaretz poll showed very different results compared to another poll conducted by the Panels Politics for Walla! which predicts that if the elections were held today, the right-wing bloc would get 62 seats in the next Knesset and the center-left bloc 58. The poll shows a strengthening of the left-wing bloc compared to a poll conducted by the institute last week, in which the gap was more significant: 68 for the right-wing bloc and 52 for the center-left bloc. According to the data, the Blue and White Party wins 30 seats and remains the leader in the race. Trailing by a small gap, the Likud Party receives 29 seats. The Labor Party follows by a wide margin with 10 seats and the United Right with 7. The New Right, United Torah Judaism and Meretz win 6 seats each. They are followed by the Shas party with 5 seats, Zehut with 5 and Yisrael Beytenu with 4. Kulanu and Gesher, according to the data, do not pass the electoral threshold.